In football, many say “defense wins championships”. 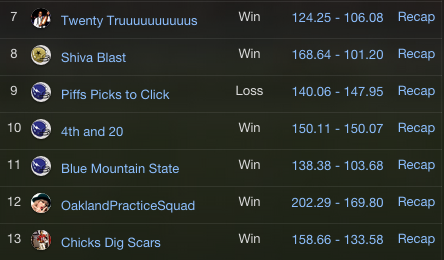 In Fantasy Football, scoring more points than your opponent wins championships. I actually find that accurate in all sports, both fantasy and real. That has been your goal on a week-to-week basis, and the overall goal was to be competitive for THIS WEEK. If you have contributors from the Broncos (Manning, Anderson, Sanders, and both D. & J. Thomas), the Patriots (Brady, Gronk, Edelman) or the Colts (Luck and Hilton), there is good chance they will get minimal reps or not even play to be preserved for the post season. How did we get here? I don’t know each every one of your seasons week-by-week, but I can chronicle mine to relate. It started with a The Draft. 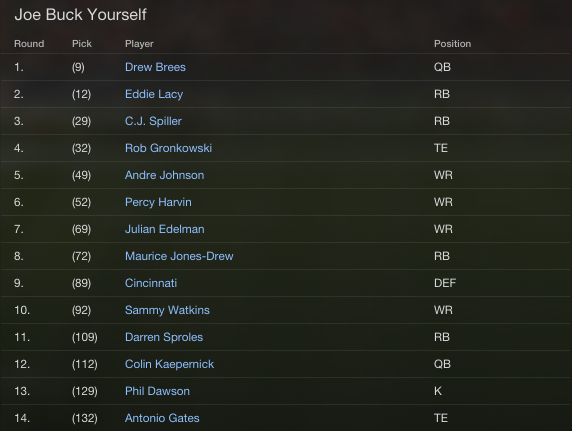 8 of my 14 picks are no longer on my team. 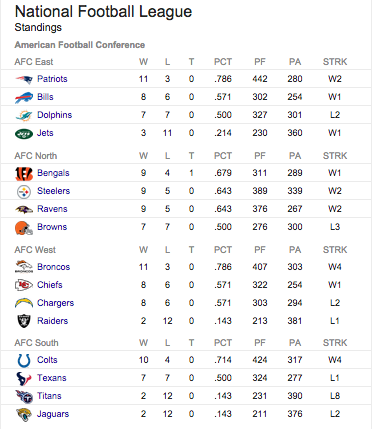 That is evident by my 0-6 start to the season. I included Denard Robinson as a part of the key moves, because my wide receiver situation has been awful and it was nice to have his consistency in my WR2 slots. 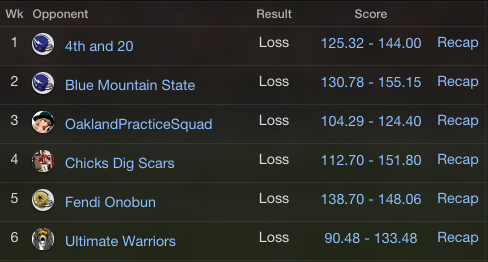 With the recent news of Julian Edelman’s concussion, I’m left making this last move hoping for points from at least one of my WR slots. Whether you call him ODJ or ODB (that’s my choice), Odell Beckham Jr. is balling out. In his past 2 weeks, Beckham has caught 23 passes for 273 yards and 4 touchdowns on 30 targets…more than anyone in the league. The 2014 rookie wide receiver class is one that is drawing comparisons to the 1983 quarterback class, and it seemed as though Mike Evans was leading the pack with his NFL leading 11 touchdowns…but now Beckham has launched himself into the conversation for “who’s better?” He’ll have an opportunity to improve his side of the debate against a Rams defense that hasn’t faced an elite receiver since Demaryius Thomas in Week 11, who caught 7 passes for 103 yards. I mentioned two quarterbacks last week that I expected to rebound after tough Week 14 games. Peyton Manning and the Broncos offense appear to be in December mode: Being smart with the football, keeping Manning upright, and riding the success of their running back, CJ Anderson…Drew Brees on the other hand, looked like Drew Brees again on Monday Night Football. I actually got to watch him throw dirt on the grave of the Chicago Bears’ 2014 campaign, in person. It was awkward…What else is worth noting, Brees is leading the league in completion percentage at 70% and red zone touchdown passes with 24. And this is a down year for him. This week, Brees faces a Falcons defense that has allowed 290+ yards to their last 7 opponents. Brees also has multiple touchdown passes in 13 of 16 meetings with Atlanta as Saints quarterback. Keep in mind, this week’s NFL schedule is weird. There are two Saturday games being played, Philadelphia vs Washington at 3:30 CT and San Diego vs. San Francisco 7:30 CT. So set your roster accordingly…And then there’s tonight’s edition of Thursday Night Football: Titans vs. Jaguars. Sounds awful, right? I’m still making a play from this game with an un-good wide receiver situation…Nate Washington. There’s gotta be some offense from somewhere tonight, and I see it going to Washington who caught 6 passes on 10 targets for 102 yards last week. Even if Kendall Wright returns tonight, Washington is expected to be the focal point against the league’s 28th ranked defense. Last week I announced the nominees for our first Fantasy Awards (First Annual is incorrect and sounds weird). I chose 4 players per category and let you, THE READERS, choose the 5th. So without further ado, here are the nominees with THE READERS CHOICE included. Next week you’ll have the opportunity to vote for the winners of each award via Facebook and Twitter. I’ll announce the results after the holidays! Good luck on your matchup this weekend don’t hesitate to ask questions!